The Big Easy. The Crescent City. La Nouvelle-Orléans. Whatever you call it, New Orleans is certainly one of the most stunning (and sinful) cities in the USA. Colonized by the French in the 1600s, this Louisiana city quickly became a melting pot of various European, African, and indigenous American cultures. Spanish, French, Creole, German, English, and many more peoples have all contributed to this city’s unique identity. If you’re thinking about traveling to New Orleans on a budget, then you’re in luck. There are numerous things to do and see in this city that cost extremely little or, in some cases, nothing at all. This article is dedicated to sharing some of the greatest cheap things to do in New Orleans. If you stick to this list, you’ll be able to take in all the most important sites in New Orleans without breaking the bank. Don’t believe us? Well then, you’d better keep reading. The French Quarter is both the oldest and most popular district in New Orleans. You can enjoy a wonderful stroll through this area without even spending a dime. The impressive buildings in this district were constructed by French and Spanish colonists way back in the 18th century. 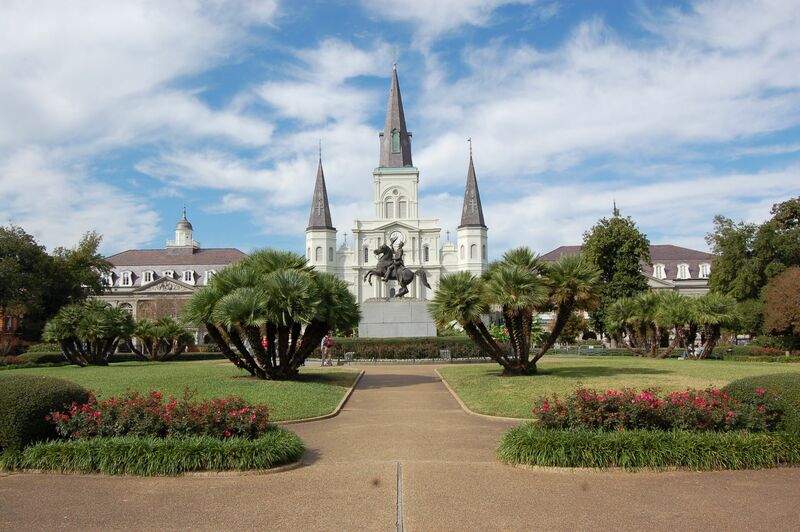 The historical heart of the French Quarter is called Jackson Square, which used to serve as the city center way back in the day. If you’re lucky, you might see a free live music show in this charming square. Within Jackson Square is the celebrated St. Louis Cathedral, which is the oldest Catholic cathedral in the entire USA. All tours of St. Louis Cathedral are totally free to the public. Of course, we can’t talk about the French Quarter without mentioning the (in)famous Bourbon Street. Just take extra precaution walking around here at night… unless, of course, you are one of those people who came to New Orleans in search of debauchery and drunkenness. For more high-class window-shopping, take a short walk down Royal Street. Although not as popular as Bourbon Street, Royal Street boasts some of the swankiest antique shops and art galleries in the entire French Quarter. A few other free tourist attractions in the French Quarter include the Cigar Factory New Orleans & Museum, the Historic New Orleans Collection, and the Old French Market. If you are going to splurge a bit in the French Quarter, we recommend spending your money on some classic New Orleans coffee and a beignet in the historic Café du Monde. Despite the fact that Café du Monde is the most popular café in all of America, it’s prices are quite reasonable. Of all the cheap things to do in New Orleans, strolling through the French Quarter should be at the top of your list. Although you could splurge on booze here, the world-renowned architecture and stunning cathedral are totally free and far easier to appreciate with a sober mind. One free park in the French Quarter that deserves special mention is the Woldenberg Riverfront Park. Locals and tourists alike love strolling, biking, and just relaxing on the well-maintained green areas of this park alongside the Mississippi. This public park was named after a philanthropist Malcolm Woldenberg and opened to the public in the 1984 World’s Fair. It’s a great idea to plan a picnic in this park while watching all the ships coming in and going out of the harbor. 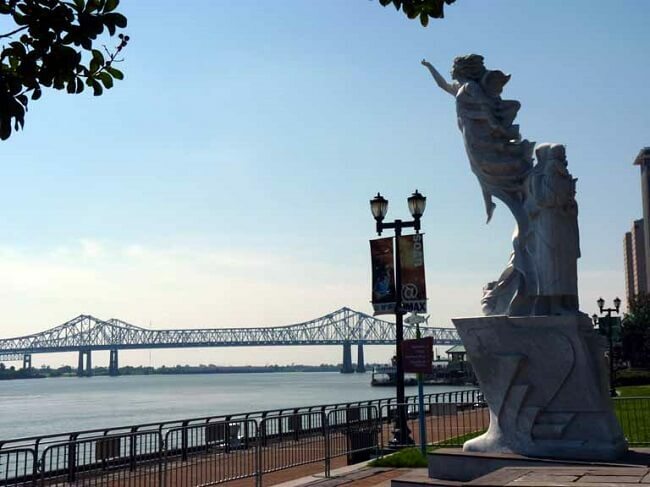 Definitely take an hour or two to enjoy this classic riverfront, certainly one of the most romantic of our five cheap things to do in New Orleans. OK, this tip will cost you a bit of money, but it’s not much and it’s totally worth it! 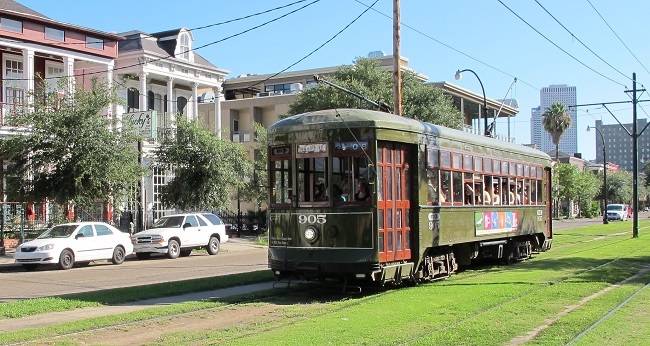 The St. Charles Streetcar is the oldest streetcar still operating in the USA. There’s simply no better way to take in the “Big Easy” than on this 13-mile 90-minute round-trip tram ride. Some of the popular tourist destinations you’ll pass along the way include Lee Circle, Brown Mansion, Loyola University, and the National World War II Museum. Of course, you can hop on and off of this tram if you want to explore any of these locations, but it’s also nice to just enjoy the soothing ride around New Orleans. A ride on the St. Charles Streetcar is certainly a worthy inclusion in our list of cheap things to do in New Orleans. Unfortunately, a fare on this tram ride isn’t free, but it’s currently only around $3 for a 2-hour pass. 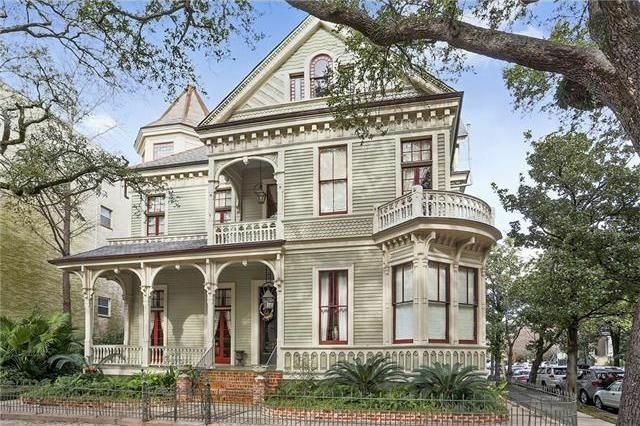 For those into fine mansions, be sure to take some time to explore New Orleans’ Uptown. Although called the “Garden District” in the 19th century, most people come to this area of the city to admire the Greek revival and Victorian-era mansions built here. There are numerous tours available for those interested in learning all about the history of these houses. If you’re looking to save a few bucks, you can walk around and admire each of these mansions from the outside. 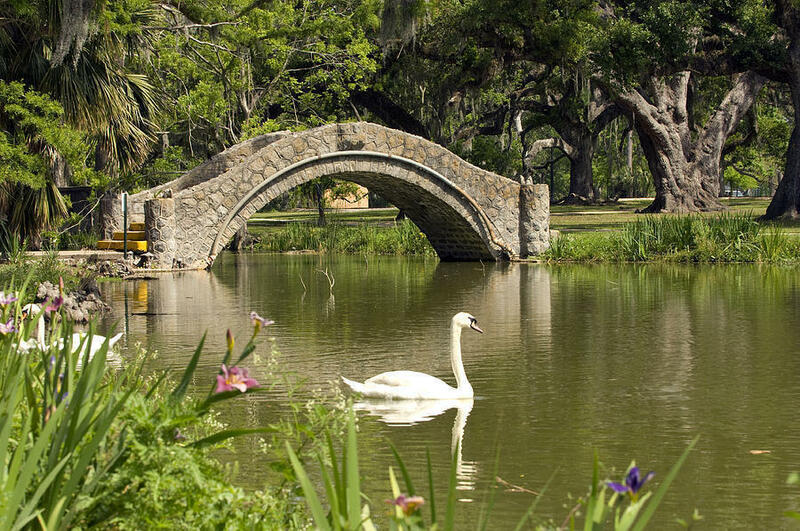 While you’re here, it’s well worth your time to check out the beautiful Audubon Park. Opened to the public in 1898, Audubon Park is well known for its old oak trees and lagoons. Many people choose to enjoy a nice picnic here while watching locals jog, bike, or just stroll around this beloved New Orleans park. Although you don’t have to, you might feel like spending a few dollars to visit the Audubon Zoo nearby or try out the Audubon Trail Golf Course. If you’re looking for a cheaper option in this area, no worries. You can take a quick stroll through the universities of Tulane and Loyola nearby. Much like the French Quarter, you’ll find some of the greatest cheap things to do in New Orleans by exploring the well-known Garden District. While it might not be as popular as Central Park, the New Orleans City Park is 50 percent larger than Manhattan’s urban park. Known by locals as “City Park,” this 1,300-acre urban park was officially founded in 1854. City Park’s main claim to fame is that it houses the world’s largest group of mature live oak trees. There’s a little something in City Park for everyone. Nature lovers will absolutely adore the parks botanical garden. Children enjoy exploring the Storyland playground and Carousel Gardens Amusement Park located here. Golfers have the option of playing on an 18-hole professional golf course, a mini golf course, and a Disc Golf course in City Park. You can even rent a boat and fish in one of City Park’s 11 lagoons if you so choose. As you can see, there are plenty of affordable attractions in City Park to keep you entertained for at least a few hours. After reading this article, if you continue to deny that there are any wonderful cheap things to do in New Orleans, well, perhaps you’re tastes are just too highbrow for us commoners. Yes, there are tons of fine dining, private concert, and shopping experiences to be had in this city if you have the money to spend. However, even someone with a meager budget can enjoy the major sights, sounds, and smells if you have a bit of purse restraint. In this list of the top five cheap things to do in New Orleans we’ve tried to give you ideas for how to enjoy yourself in the city’s most iconic areas for free. Although you can’t survive in New Orleans without any money at all, you can have an incredibly memorable trip with only a few hundred dollars in your pocket. So, go ahead. N’awlins is calling you.